Wood, leather, recipe cards, whisk, bowl, french towel, vinegar, olive oil, soy sauce, canned anchovies, ketchup, mustard, Monosodium Glutamate (MSG), salt and pepper. Nestled in the pages of famed gastronomer Jean Anthelme Brillat-Savarin's 1825 treatise, The Physiology of Taste: Or, Meditations on Transcendental Gastronomy lies the story of a not-so-famous French entrepreneur by the name of Chevalier d’Albignac (1739-1825). In fleeing the French Revolution, d’Albagnac brought with him to London the French reputation for expert salad making. After a chance encounter with hungry and impressionable young Englishmen and a resulting opportunity to share his craft, his calendar quickly filled with private appointments in the homes of London’s upper class, assembling salads and dressing them with a freshly mixed vinaigrette. 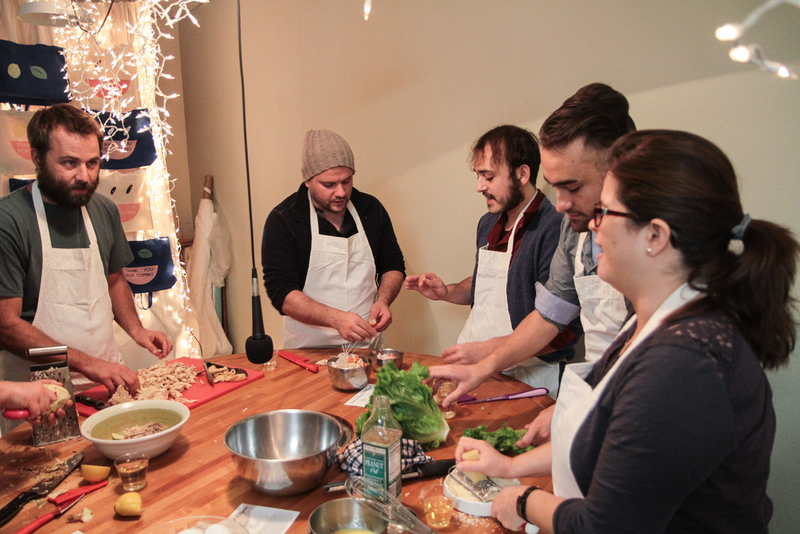 To profit from his growing venture, d’Albignac fabricated the “Fashionable Salad-Maker” kit. This mahogany case accompanied him and his servant on house calls for delicately prepared salads made from exotic ingredients. The portable gastronomic laboratory included vinegars, oils (with and without fruity flavor), soy, caviar, truffles, anchovies, ketchup, mustard, meat extracts (gravy), egg, salt and pepper - essentially all ingredients needed to make what is known today simply as “French Dressing.” From his oft-requested salad visits and the sales of his mass-produced cruet-boxes, d’Albignac made a small fortune and acquired international acclaim. Yet despite his successes d’Albignac is rarely found in the pages of culinary history. With Fashionable Salad-Maker Kit (for Chevalier d’Albignac), Christopher Reynolds has resurrected the neglected story of d’Albignac. His contemporary revival and reimagined d’Albignac salad kit presents a historical view into food trends, a concept that remains as relevant today as it was in the 18th and 19th centuries. Drawing parallels of performance art and food preparation, the artwork functions as a pseudo-historical artifact with contemporary utility. This kit is an assemblage of the ingredients and tools needed to concoct d’Albignac’s French dressing, including Reynolds’s own contemporary addition of Monosodium Glutamate (MSG). The inclusion of this ingredient - uncommon in Western home cooking but ubiquitous on the ingredients list of packaged snack foods and pre-made dressings found on supermarket shelves - points to consumers’ unrelenting desire for more potent flavors in their food. 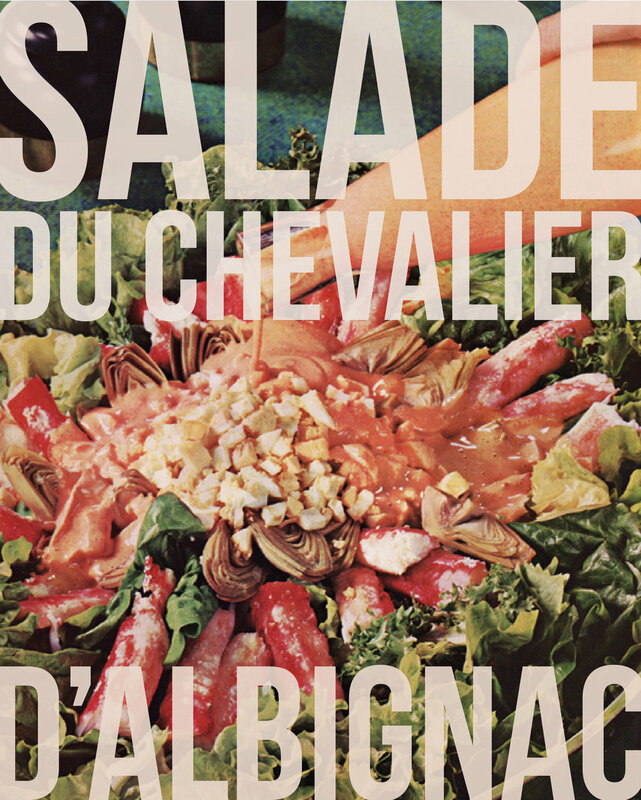 In conjunction with the kit, Reynolds and active participants will give a performance titled Salade du Chevalier d’Albignac in which they will make the salad named after d’Albignac himself. Both the Fashionable Salad-Maker Kit and Salade du Chevalier d’Albignac are influenced by the work of Fluxus artist Alison Knowles and her 1962 art performance Make a Salad. 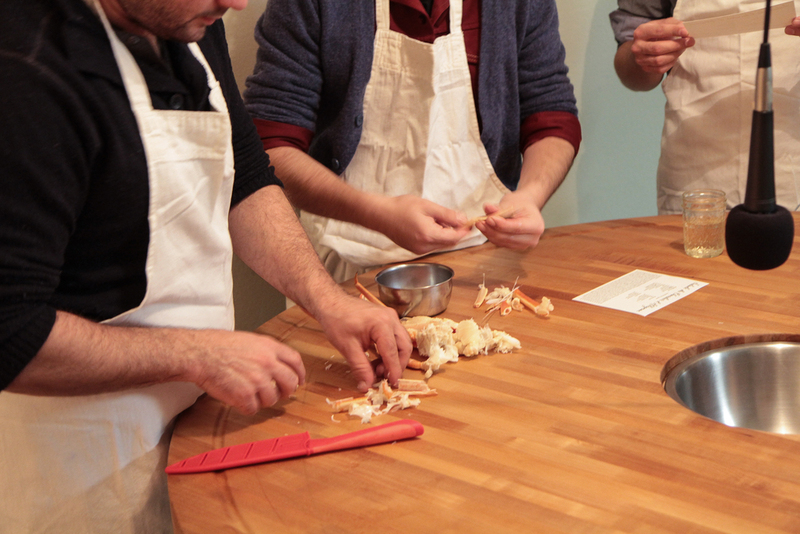 Similar to Knowles’ desire to connect high art with daily life, Reynolds underlines the often undervalued ritual of preparing and sharing food. Within his own practice, Reynolds directs our attention to historical storytelling to discuss present-day food topics such as economic class systems and mass production as well as understanding rituals of preparation and consumption. By placing emphasis on the ingredients and instructions, Reynolds provides a historical and contemplative look into something as simple as making a salad.